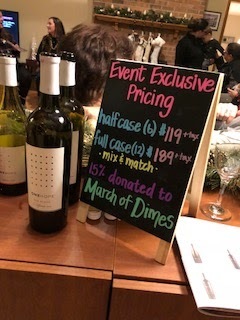 Last night, we hosted our first fundraiser for our March of Dimes team, Musical Miracles. 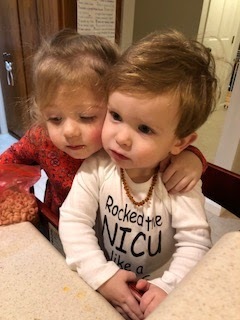 Emma and Ness were both premies and both of our families were greatly helped by the March of Dimes while our babies were in the NICU. So last year, we joined forces and started our own team together to continue to support the March of Dimes and other families. We raised over $2500 last year and this year we are shooting to hit $5000. Last night, we had our first fundraiser of the year. My friend Kendra drove in from Boston for it and it was seriously awesome. 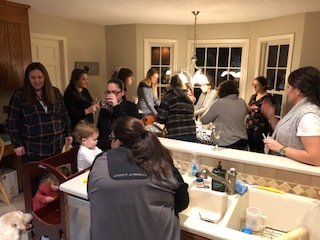 We had an amazing turnout and OneHope wines is truly an incredible company. If you're looking for a great way to raise funds for a charity close to you, this is a great way to do it! We set up some light snacks in our kitchen - a cheese and charcuterie board, some brie bites, sweet and sour meatballs, bruscetta, and some cookies. Nice and easy and simple clean up! 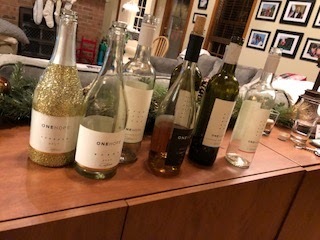 We had the wine and tasting in our family room. 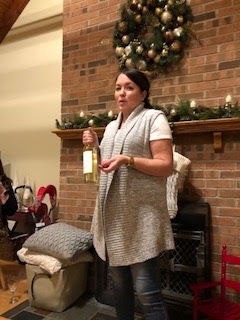 Kendra did a nice job as our wine connoisseur and poured the first bottle, a brut, while we all mingled. 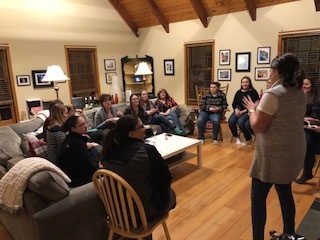 We then all gathered in the family room for an overview of OneHope and the work they do. Not a boring presentation, but fun and informative and enlightening! Not only do they donate 15% of sales to the charity of your choice, but each bottle also supports a charity they are affiliated with, including female empowerment, hunger, and more. Seriously, who doesn't want to buy wine and support worthwhile causes?! And they have super cute gift baskets that we were all eyeing!! What was also nice was getting a half case or full case gets you a discount and averages to about $15 a bottle, and the wine is GOOD. Even a "cheap" wine still costs you that much! We are looking forward to other fundraisers before our walk in May but are so happy we did our first one with Kendra and OneHope! And when your counter is stacked with a bunch of empty wine bottles, you know it was a great night! 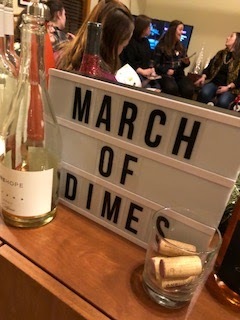 If you'd like to support our March of Dimes team, simple click here OR if you're salivating for some wine and want to support our Musical Miracles that way, click here! As my shirt says, rose and shine! Cheers!